Among the many traditional Chinese festivals celebrated in Hong Kong, the Mid-Autumn Festival is one of the most colourful. For centuries, the Mid-Autumn Festival has been one of the most important Chinese festivals, a time when families get together to celebrate the abundance of a good harvest and to gaze at the full moon. Children play with lanterns of different shapes and colours adding a delightful ambience to the festivities. Traditionally, the festival is a three-day event, with people welcoming the full moon on the 14th day of the eighth moon and bidding farewell to the celestial orb on the 16th day. The 15th day is often marked by a family day at home and in recent years it has become customary to take young children to the nearest park after dinner and settle down on the ground to light small candles and nibble moon cakes. Moon cakes are a traditional and indispensable part of the Mid-Autumn festivities and are available from bakeries, supermarkets and some restaurants from about the end of August. Friends and relatives give one another moon cakes as gifts to convey blessings and good fortune. Moon cakes date back to the Yuan dynasty when Han Chinese rebels passed secret messages to one another hidden in the cakes to prevent their plans for insurrection being discovered by their Mongolian rulers. The celebrations also include colourful Chinese lanterns. Shops all over town sell coloured Chinese paper lanterns usually in the shape of animals, but more recently, in the shape of space ships and cartoon characters etc. 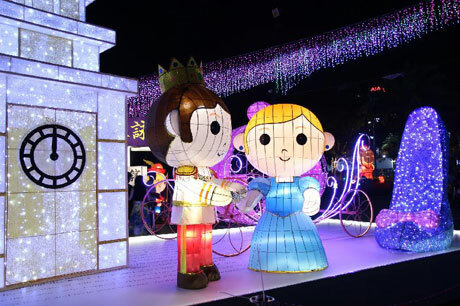 There are also large thematic lantern displays in different areas of Hong Kong. Each year the Urban Lantern Carnival is held at Victoria Park in Causeway Bay. Lantern Carnivals are also held in the New Territories East and New Territories West at different venues each year. In 2017 the NT East Carnival was held at Sha Tin Park and the NT West Carnival at Tsing Yi Park. In 2018 the NT East Carnival is being held at Tai Po Waterfront Park and the NT West Carnival at Tuen Mun Park. At each venue events include a range of stage performances as well as crafts workshops and demonstrations and lighting installations. 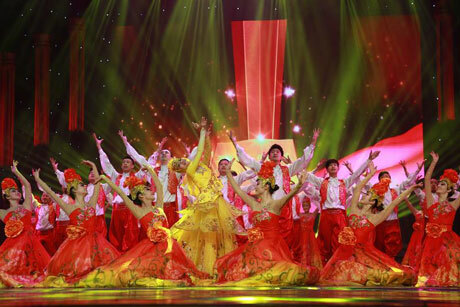 The Ningxia Arts Troupe, supported by the Office of Hong Kong, Macao and Taiwan Affairs of the Ministry of Culture and Tourism, will perform spectacular folk songs, dances and acrobatic shows in all three carnivals. In addition, folk craft demonstrations by Guangdong and local masters, including Guangdong paper-cutting, plaster moulding, unicorn paper crafting and Guangcai (Guangzhou famille rose porcelain) craftsmanship, will also be featured. The carnivals are each decorated with colourful lanterns. Another feature of the Victoria Park carnival is an exhibition on traditional paper crafting. 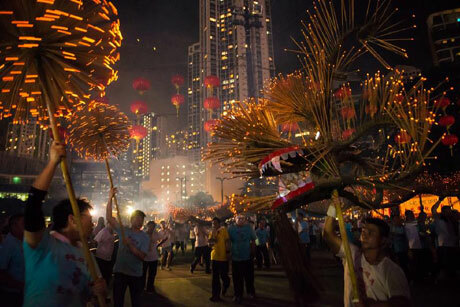 Organised by the Intangible Cultural Heritage Office of the LCSD and inspired by the lucky bat decoration used in fa pau (paper floral tributes), a local craftsman handmade some 90 colourful bat-shaped lanterns to create the image of auspicious bats dancing in the sky. 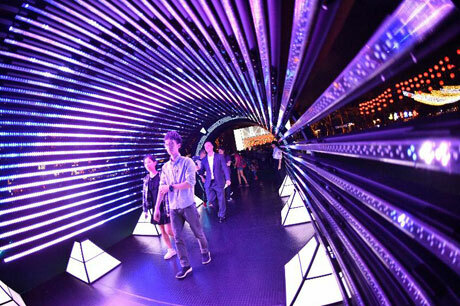 A thematic lantern display is also held each year outside Hong Kong Cultural Centre in Tsim Sha Tsui for about two weeks around the time of the Mid-Autumn Festival. For details of the 2018 carnivals see below. The main Lantern Carnival (Urban Lantern Carnival) and other Mid-Autumn events are held at VICTORIA PARK in Causeway Bay. Further details to be announced nearer the date of the festival. Programme : Spectacular Chinese ethnic songs, dances and acrobatics, a choral performance, children's theatre performances, a fire dragon dance parade, a lantern riddle quiz, astronomy talks and documentary screenings, a star-gazing activity, a creative market and demonstrations of Guangdong and Hong Kong folk crafts and the conclusion of the Tai Hang Fire Dragon Dance Parade . 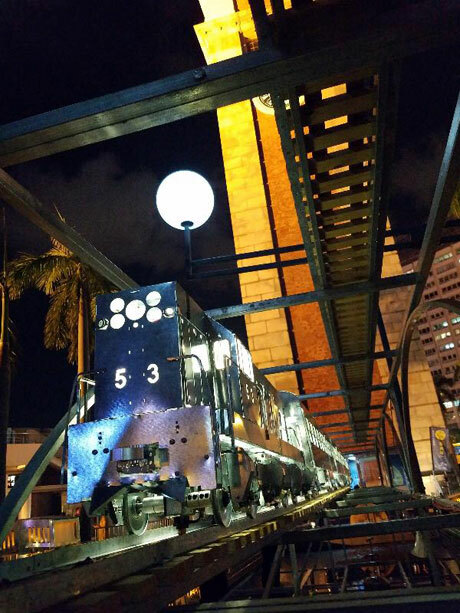 With the theme of "Full Moon across the Universe", the Victoria Park carnival will showcase different lighting installations inspired by the starry sky, including "Time Expressions", "Asteroids and Comets" and "Cassiopeia Constellation", presenting a journey into the galaxy. Another highlight at Victoria Park is an exhibition on traditional paper crafting. 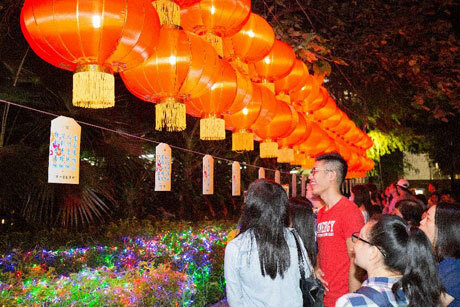 Organised by the Intangible Cultural Heritage Office of the LCSD and inspired by the lucky bat decoration used in fa pau (paper floral tributes), a local craftsman handmade some 90 colourful bat-shaped lanterns to create the image of auspicious bats dancing in the sky. 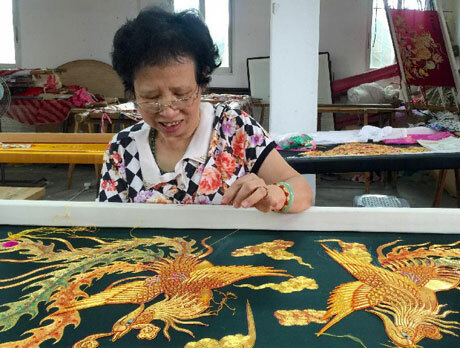 Folk craft demonstrations by Guangdong and local masters, including Guangdong inside painting of snuff bottles, birdcage production and Hakka embroidered band knitting craftsmanship, will be featured. Photo shows a Chaozhou embroidery demonstration. GETTING TO VICTORIA PARK: MTR to Causeway Bay Station, then take Exit E, turn left and follow Great George Street to the park, which is located opposite the end of the street, or MTR to Tin Hau Station, then take Exit A2, turn left and continue ahead until reaching the park. 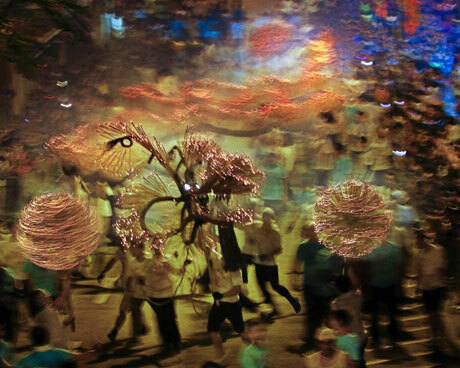 Coinciding with the Mid-Autumn Festival is the unique Tai Hang Fire Dragon Dance - a spectacular ritual that is considered one of the most extraordinary events during this Festival. In 2011, the Tai Hang Fire Dragon Dance was inscribed on the third national list of ‘Intangible Cultural Heritage’ by the Ministry of Culture in China. The Tai Hang Fire Dragon Dance has been performed for more than 100 years. Tai Hang, located in Causeway Bay, was originally a Hakka village. Legend has it that a plague broke out there in 1880s and to ward off the disease, the villagers planted joss sticks in a dragon made of grass. On the evenings of the 14th, 15th and 16th of the eighth lunar month, the villagers paraded the fire dragon through the village while letting off firecrackers. The plague ended soon after the event. From then on, the villagers have performed a three-day fire dragon dance every year to bless themselves. The Tai Hang Fire Dragon Dance was inscribed onto the third national list of intangible cultural heritage by the Chinese Ministry of Culture in 2011. In 2017, supported by nearly 300 performers, the fire dragon measured as long as 67 metres. Its head alone weighs 48kg. Its body is divided into 32 segments and uses up a total of 72,000 incense sticks during the three-day* performance. After the performance, the dragon is delivered to the sea to symbolise the dragon returning to the sky after it has dispelled the plague in the village. * the Dance is usually held over three days and nights. However, in 2017 the event was extended to a fourth night to allow more visitors to experience the tradition. * on 24th September the route of the Tai Hang Fire Dragon Dance is extended to Soccer Pitches 4 and 5 in Victoria Park from 10-45pm to 11-30pm to allow visitors to enjoy the dance and the Lantern Carnival and other Mid-Autumn celebratory activities in the park. To facilitate the holding of the Fire Dragon Dance in Tai Hang, there will be road closures and traffic diversions in Tai Hang from 6pm to 11pm daily from 23rd to 25th September. Parking spaces in the area will be temporarily closed. Full details will be announced on the Transport Department website at a later date. The parade pauses at every shrine along the route to perform rituals to pray for prosperity for the coming year and ends at Waterfall Bay to symbolise the return of the dragon to the sea. Pok Fu Lam Village is one of 67 global cultural heritage sites included in the World Monuments Fund’s World Monument Watch and the first site in Hong Kong to be included in the watch, which is published every two years. The New York-based fund considers the modest appearance of the village belies its historical importance. The settlement perched on a hillside to the west of Hong Kong Island, is characterized by narrow lanes and alleys twisting through the village, around small traditional buildings and newer structures. The village includes the remnants of the original Dairy Farm building, set up in Pok Fu Lam in 1886, to provide Hong Kong with fresh milk. Stringent squatter control policies make it hard for villagers to repair their dwellings, as they are required to use materials that were registered at the time of the last occupancy survey, which was conducted in the 1980s. GETTING TO POK FU LAM VILLAGE: Pok Fu Lam is not served by MTR. Several Citybus bus routes provide frequent services to the Pok Fu Lam Village bus stop on Pok Fu Lam Road, including 91 (from Central Ferry Piers), 40M (from Admiralty via Central), 30X (from Central Exchange Square), 37A & 37B (circular routes from Chi Fu Fa Yuen via Central/Admiralty), 71 (circular route from Wong Chuk Hang via Central) and 973 (from Tsim Sha Tsui). The Transport Department (TD) is implementing special traffic and transport arrangements on Hong Kong Island and in the New Territories to facilitate Mid-Autumn Festival activities and the Fire Dragon Dance in Tai Hang. To facilitate the holding of the Fire Dragon Dance in Tai Hang on Hong Kong Island, there will be road closures and traffic diversions in Tai Hang from 6pm to 11.59pm daily from 23rd to 25th September. Parking spaces and taxi stands in the area will be suspended. Road closure arrangements will also be implemented in various parts of Hong Kong Island (including the Peak, Repulse Bay, Shek O, Stanley, Pok Fu Lam and Aberdeen) and the New Territories (including Tuen Mun, Tsuen Wan and Ma On Shan). Part-time pedestrian schemes and learner driver prohibited zones will be set up. Car parks, roadside parking spaces, taxi stands and public light bus stands will be suspended. The Police may adjust the implementation of road closures and traffic diversions, subject to the prevailing traffic and crowd conditions in the areas. * Ferry services operated by Hong Kong and Kowloon Ferry (HKKF) will be enhanced according to passenger demand. Members of the public are advised to make use of public transport services so as to avoid traffic congestion and unnecessary delays. Motorists should avoid driving to the affected areas. In case of traffic congestion, they should drive with patience and follow the instructions of the Police on-site. The TD and the Police will closely monitor the traffic situation and implement appropriate measures as necessary. Motorists and the public are advised to pay attention to the latest traffic news on radio and television. There will be no mail collection and no mail delivery on 25th September 2018, the public holiday for the day following Chinese Mid-Autumn Festival. All post offices will be closed on that day except the General Post Office at Connaught Place, Central and the Airport Post Office. The business hours of the two offices will be from 9am to 5pm and 8am to 5pm respectively. General postal services will be provided. Details of services available will be advertised at the respective post offices.